Gemma ditches her high-flying job and returns to Oxford to follow her dream: opening a traditional English tearoom serving warm buttery scones with jam and clotted cream, and fragrant tea in pretty bone china… Only problem is–murder is the first thing on the menu and Gemma is the key suspect! And the only people Gemma can turn to for help are four nosy old ladies from her local Cotswolds village – not to mention a cheeky little tabby cat named Muesli. Who was the mysterious woman Gemma met on the flight back from Australia and why was she murdered? Now Gemma must find the killer, solve the mystery and clear her name if she’s to have her cake–and serve it too. This PREQUEL to the OXFORD TEAROOM MYSTERIES includes BONUS CHAPTERS FROM “A SCONE TO DIE FOR” (BOOK 1). It is shorter than the rest of the series – which are all full length novels – and can be read as a standalone, before or after any other book in the series. 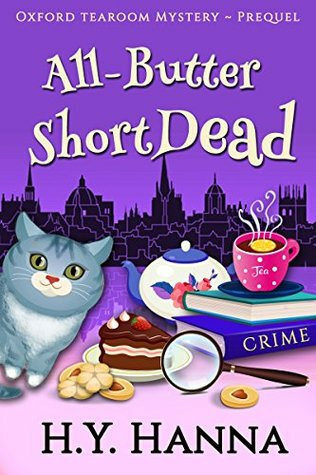 All-Butter ShortDead is a short prequel novella for the Oxford Tearoom Mysteries series. As a big fan of this series I was excited to hear there would be a prequel. This prequel takes place before book 1 and tells the story of how Gemma returned to the UK and started her tearoom. I have already read the first 4 books in this series, but I thought it was fun to go back where it all started and see a glimpse of what happened before 1. But I think you can also read it before book 1, it will just be a different experience. As I knew what is going to happen in the next books, it provided some fun perspective in a few scenes and the last few lines of the story made me smile knowing what’s going to happen next. There is also a small murder mystery in this book, I thought it wasn’t as good as in the full length books simply because things happened a bit faster and there was less slow build-up, wading through clues and red herrings. It all just happened a bit faster, but with how short it was the author still did a great job making it a fun mystery. And I liked the plot twist at the end. I had guessed someone else as the murderer. So overall it was still an interesting mystery that kept my attention. Although it also made me a bit sad about who died and why. I enjoyed seeing Gemma adapt to the British weather and life when she returned and how nostalgic Oxford was for her. I enjoyed seeing this piece of her history. We also see most of the characters we got to know in the series like the Old Biddies, Gemma her mom, Gemma her friend Cassie and Muesli ofcourse. There was a fun scene where Gemma meet Muesli for the first time. To summarize: this is a fun prequel novella, that shows how Gemma started her tearoom and returned to Oxford. We see how Gemma meets Muesli and the old Biddies, gemma her mom and Cassie play a role as well. I liked getting this extra piece of Gemma her story and there was a short and fun murder mystery as well. It was a bit less intricate than the mysteries in the full length novels, but it kept my attention and I there was a good plot twist at the end. Overall a fun read for fans of the series or for those new to the series to start the series here. Do you like prequel novels? Yes! When you know the characters and then you get a chance to see how they came to be where they were. One of my alltime favourites is The Lives of Christopher Chant which was published nearly a decade after Charmed Life and explores how the enchanter Chrestomanci was as a child. I know it’s written for children, but I still love, love those stories. Such wisdom and passion in them! It was really interesting to go back in time and see how Gemma started the tearoom and met Meusli for the first time. I haven’t heard of the book you mentioned, but as long as it’s a good book i don’t think it matters if it was written for children. I seriously need to start on this series. I think I’ll try to fit them in during my next vacation. I’m a bit one the fence about prequels. Some have been great–they’ve filled in the blanks and smooth out some details that was missing. Although others sort of fall flat. So, if they’ve don’t right, I think they can be a big addition to the series. I hope you’ll enjoy this series as much as I do! It’s one of my favorite cozy mysteries series. I agree prequels definitely can fall flat when not well done. In this case it’s not necessary to read the prequel, but I did think it was fun to get some extra information ad see Gemma come back to England and start the plans to open her tearoom. It does seem like a mystery can’t be done AS well in a shorter novel, but I’m glad you still seemed to like this one overall. I don’t mind prequels if I really liked the book. I agree it makes sense the mystery will go a bit faster and is less developed in a shorter read, but it did work and it was a great read. Hi Lola – thank you as usual for a lovely, thoughtful review! I always enjoy hearing your thoughts on my books and I’m so pleased that you liked he prequel, and felt that it fit in well with the rest of the series. Thanks for stopping by! It was really fun to see how Gemma started the tearoom and met Meusli. It definitely fits in well with the rest of the series. I think you did a good job with the mystery in a shorter read, but yes mysteries are more satisfying in a longer book. Interesting to hear that’s the same for the author too. I am already looking forward to the next book in the series! Oh, I’m so glad this was a good one. I snagged it as a freebie last week b/c I saw it was the prequel to the series you love. I had a feeling that it would go along pretty quickly with the mystery and other plot pieces since it’s a novella. I’m okay with novellas even as prequels, but they can go either way. I’ve read a few prequels that would have turned me off from the series if I hadn’t already read the series books, but I’ve read others that got me excited to read the series. I am glad you got it when it was free! This really is a great series and this prequel works great as introduction to the series or to return to the past and see how the story all started. Yes the mystery and plot moves a bit quickly due to the novella length and the mysteries in the full length novels are better, but it was fun to find a small mystery in this one too. Prequels definitely can go either way. I wouldn’t know how this one would work to read before the series, but I think it would. Although reading it after book 4 worked great for me too. I hope you’ll enjoy this one if you get around to reading it. please let me know when you do! I think I like prequals when they expand on the world of the series, but don’t need to be read for fear of missing out on something essential? I also cannot get over how cute that cover is! I agree and that was exactly how this prequel was handled. It was fun to get the extra piece of story, but you can also enjoy the series and not miss anything essential if you don’t read it.